Most people dread cleaning the oven. It is an arduous task which can take forever if you don’t have the right tools or even an oven which will co-operate. Luckily, in today’s ‘smart technology’ world, some brands are producing ovens which have self-cleaning features or are designed to make cleaning easier. Bosch believes in creating ‘simple yet stylish’ ovens. However, besides looking sleek in your kitchen, all of the company’s new ovens come with a groundbreaking self-cleaning feature. So, how does it work? There is a pyrolytic self-cleaning system built into each oven. During the cleaning cycle, the oven is heated to 480 degrees- at this temperature, any deposits are turned into ash, which can then simply be wiped away by using a damp cloth. However, you should ensure that you leave the oven to cool before wiping it down. There are also three different functions depending on how dirty the oven is. Catalytic liners also help to reduce the amount of oven cleaning that you need to do as they collect grease and dirt which is then burnt off. Similar to the Bosch models, new Zanussi ovens also feature catalytic liners to help absorb fat and grease. You can also remove the double glazed panes of glass from the door for more thorough cleansing. The oven’s pop out dials also maintains a smooth facade and make the control panel easy to wipe down. Otherwise, hire a professional. If you just can’t face cleaning your oven, or perhaps it is an Aga model that needs a bit more attention, or you own a commercial kitchen, why not bring the professionals in? Here at Premier Oven Clean, an oven cleaning company for Warrington, we pride ourselves on high-quality cleaning and first class service. 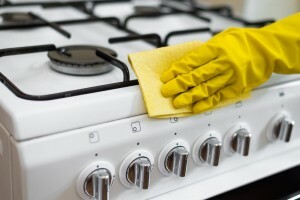 Our specialists are highly trained in cleaning a range of appliances such as hobs, extractor fans, microwaves and BBQs. Our range of solutions is caustic free and is formulated to tailor to a range of brands. When we are finished, you will have a hygienic kitchen that you can use straight away, no fumes or mess.